One of the greatest unknowns in global climate change science is how changes in extreme events will impact on the natural world. Emerging evidence strongly suggests that changes in the frequency, duration and intensity of extreme events (e.g., heat waves) will be even more important than gradual increases in climatic means in driving ecological responses to climatic change. Our research program examines what drives vulnerability of terrestrial biodiversity to temperature extremes in order to make robust predictions of impacts under future climate scenarios. 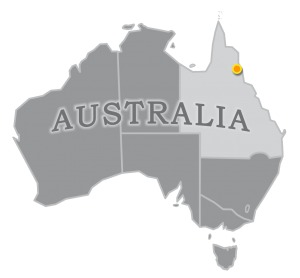 It focuses on a model ecosystem (Australian Wet Tropics bioregion), known to be under threat from climate change (Williams, Bolitho & Fox 2003), and on a model taxonomic group (flying-foxes), known to be vulnerable to extreme heat events (e.g., Welbergen et al. 2008). 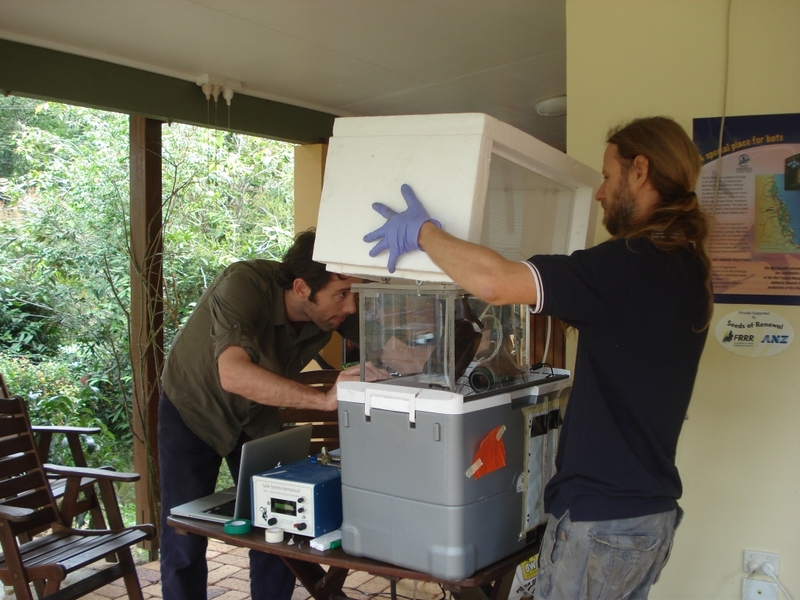 Our work at the Tolga Bat Hospital is part of our broader efforts to produce accurate estimates of the thermal sensitivity of the Wet Tropics vertebrates. The information will help us quantify the vulnerability of these animals to extreme temperature events, which is crucial for predicting the impacts of climate change on biodiversity and for preserving Australia’s unique natural ecosystems in this century and beyond. Williams, S. E., Bolitho, E. E. & Fox, S. 2003. Climate change in Australian tropical rainforests: an impending environmental catastrophe. Proceedings of the Royal Society B-Biological Sciences, 270, 1887-1892. Welbergen, J. A., Klose, S. M., Markus, N. & Eby, P. 2008. Climate change and the effects of temperature extremes on Australian flying-foxes. Proceedings of the Royal Society B-Biological Sciences, 275, 419-425. Go to the Animal Ecology Lab to learn more and see their heat stress forecaster. Also go to our page on Heat Stress under Our Bats. 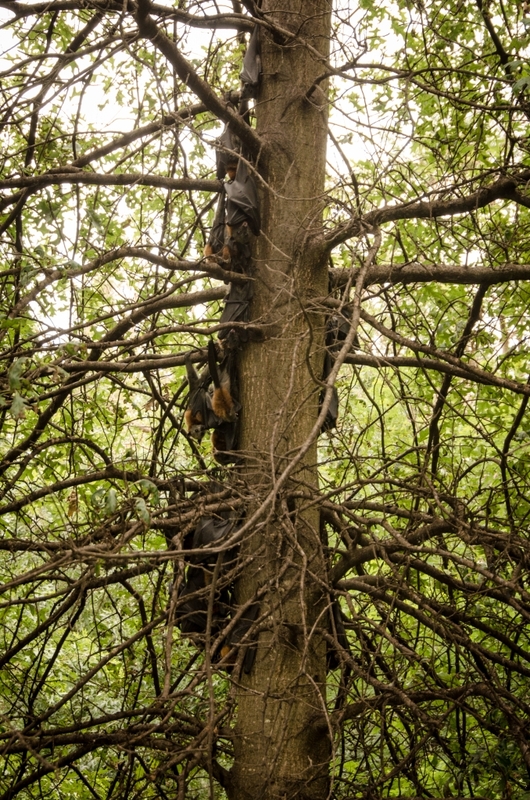 Photo (right) Clumping Bats will come down out of the canopy and clump on to the shaded side of the trunk of the tree. The surface temperature of the bark is cooler than the air temperature. We collected 233 bat flies and 99 ticks during the 2012 tick season. They will be used to determine if they play a role in disease transmission in bats. The DNA laboratory at the Museum was involved in a national project to identify animals that come down as a result of plane strike. They requested DNA samples (wing biopsies) from 3 species of flying fox we have in care to help build a reliable DNA database on the four species of Australian flying fox. Plane strike usually results in only a blood smear/tissue of the animal from the plane. 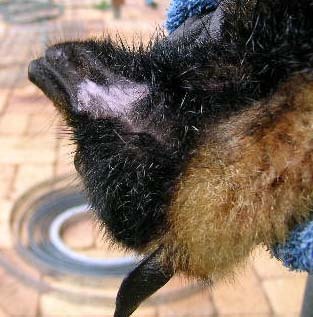 We provided some Spectacled flying foxes in our care with a diet that included markers to detemine how fast food is incorporated into the tissues of the animal, in this case hair. 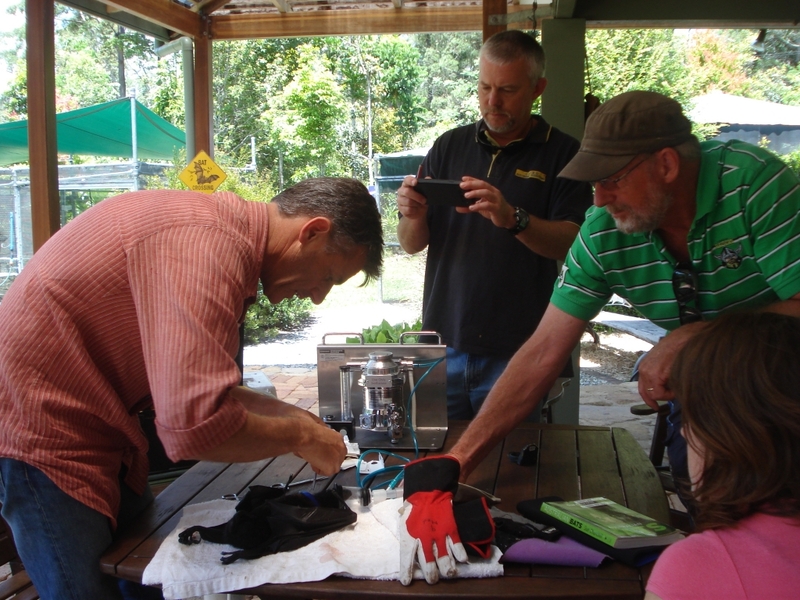 We provided 100 dead Spectacled flying foxes from the 2008 tick season for stable isotope research. All animals were found dying of tick paralysis and assessed to be non-viable for treatment. Analysis of the hair had some interesting results, showing that the diet of SFFs is quite variable. 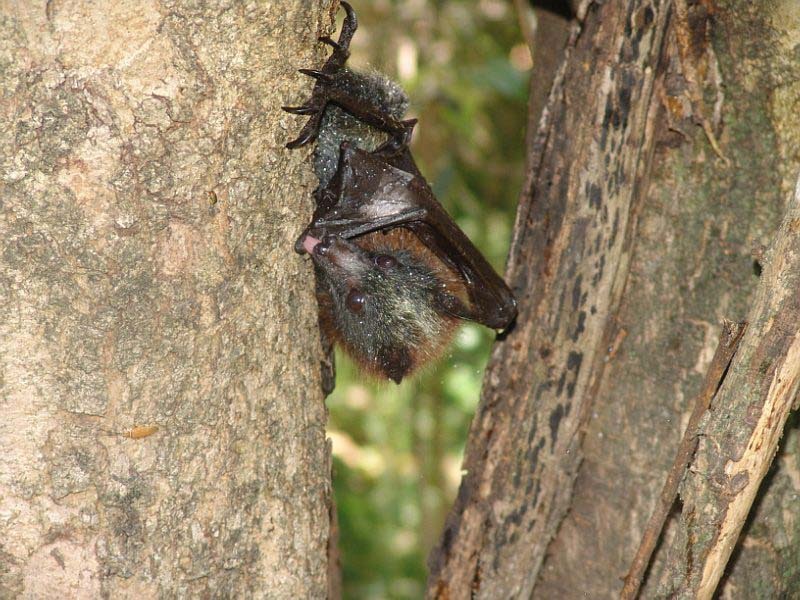 The project, involving the Queensland Parks and Wildlife Service, Queensland Fruit and Vegetable Growers, the Tolga Bat Hospital and JCU used genetic fingerprinting to attempt to trace the movements of the Spectacled flying-fox. Microsatellite and Amplified Fragment Length Polymorphism (AFLP) genetic markers were used to identify individual flying-foxes killed by tick paralysis. Some wild-caught bats were also used in the study. The project also determined the age structure of SFFs from the Tolga colony dying as a result of tick paralysis. Canine teeth were taken from all dead bats over 2 tick paralysis seasons, and a cross-sectional analysis performed on the layers of cementum in the root of the tooth. The research is based on a paper published by Dr Simon Cool from the University of Queensland in 1994, Age Estimation of Pteropid Bats (Megachiroptera) from Hard Tissue Parameters. Sam lived at the Bat Hospital for several months during the 2004 tick season. She accompanied us on searches in the camps, and when back at the hospital took teeth from the dead and euthanased, and wing biopsies from the dead and living. 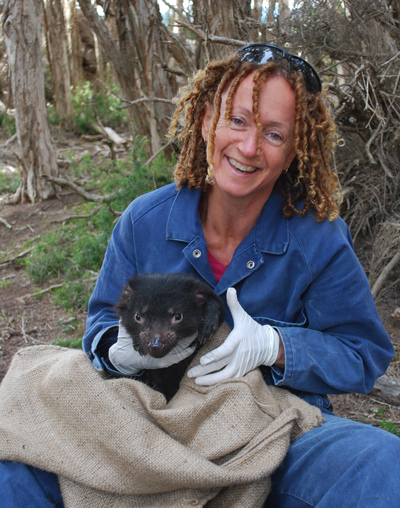 After receiving her PhD, Sam Fox has spent her career working with Tasmanian Devils. 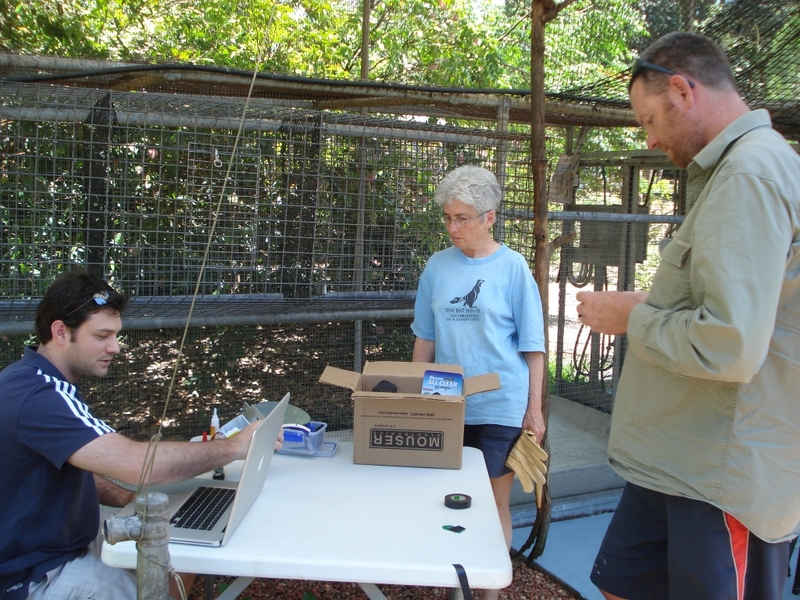 We have trialled tracking collars for a range of agencies – radiotracking, GPS and satellite. 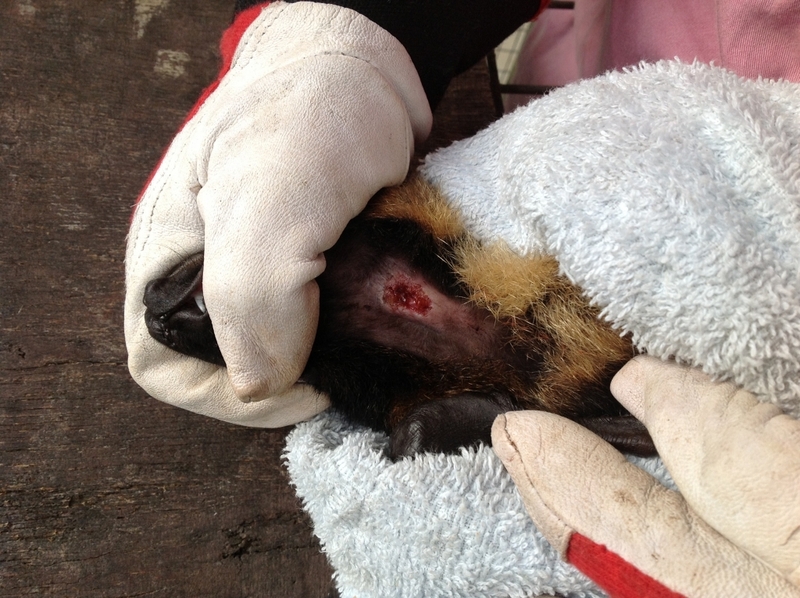 There have been problems with a lot of the collars causing skin damage during trials and even death out in the field. 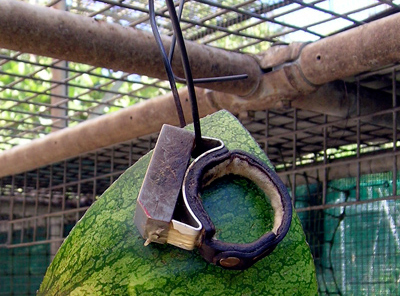 We urge all researchers to do extensive trials before using collars. CSIRO staff trailing collars. The bats are anaesthetised so the collar can be measured and fitted satisfactorily. Rubbing from the collar is a real issue. This sort of injury in the wild would slowly worsen and cause death. This collar being trialled in our cage was a little too big and came off when it was caught, but is a much better outcome for the bat int he wild than if the collar was too small. CSIRO staff trialling a GPS collar system.We have been involved with trialling collars with various technologies attached – radio tracking, GPS and satellite. Flying-foxes that don’t cope mentally with the collar will repeatedly try to lick the collar but cannot reach it. The licking and excessive saliva results in hair loss after a couple of days. 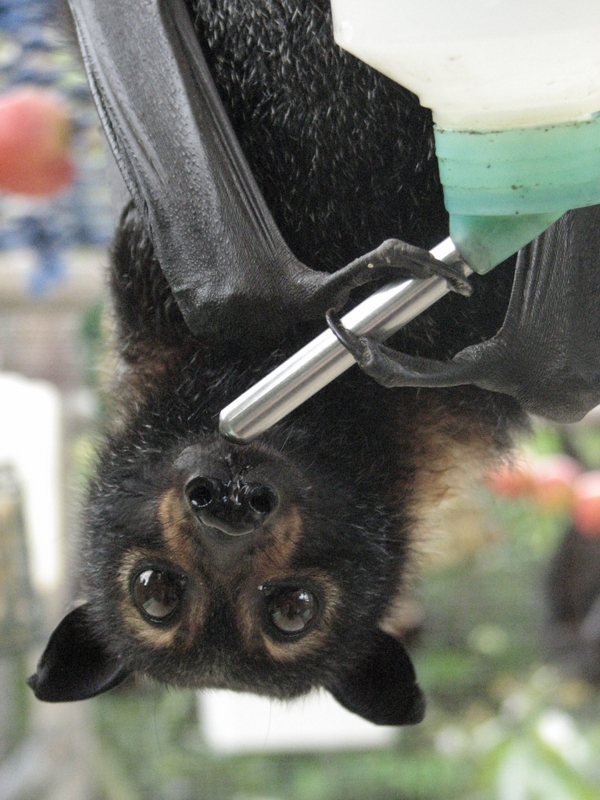 We will look at the consumption of salt by 4 Australian species of flying fox at the Tolga Bat Hospital. 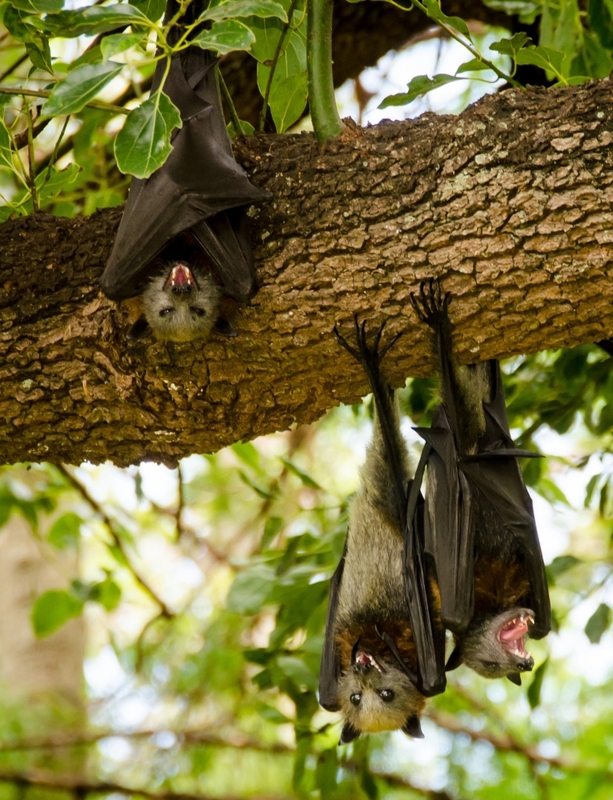 Stable isotope studies by CSIRO on Spectacled flying foxes have shown that mangrove provides about 13 % of their diet, and anecdotally flying foxes are frequently observed drinking from sea water and brackish water. Some institutions in USA provide flying floxes with salt licks but the Bat Hospital provides salt in drink bottles at the rate of 4 gms to 2 litres. Generally about twice as much salt water is comsumed conpared to fresh water. Both fresh and salt water bottles hang together so the choice is always theirs. The lids of the bottles are green for salt and red for fresh. The only mention of this in the literature is a paper by Iudica and Bonaccorsro in Mammalia 2003 Anecdotal observations of sea water ingestion by flying foxes of the genus Pteropus. A researcher with a strong interest in wildlife conservation, Ali completed a B.Sc. in environmental and marine biology at St-Andrews University, with an honours degree in ecotourism. Two years working as a guide for a whale-watching operation, followed by a third year working as a research assistant in the whale-watching industry prompted her to undertake a PhD degree in tourism, in an effort to link the two areas. By combining tourism and wildlife conservation, she hoped to gain public support for conservation and increase the personal relevance of wildlife protection for the general public. The aim of her research was be to understand the expectations of volunteers, and the benefits they receive for their efforts. This understanding may help organisations build higher levels of volunteer involvement, satisfaction and commitment by matching the volunteer’s expected benefits and benefits that they provide. This would hopefully lead to a more sustained on-site conservation effort from volunteer tourists. Research on volunteer tourism wass a relatively new area in 2004 and included few studies on the profile of volunteer tourists and the typology of volunteer tourism conservation organisations. Little was known about how volunteer tourists perceive their experience and how satisfaction with their experience affects their involvement with, and commitment to, conservation efforts. Understanding these elements is important as volunteers form the backbone of such organisations. By giving their time, energy and funds, volunteer tourists enable vital conservation projects to be carried out. In return, the tourists participate in a unique experience, develop new skills, discover a new way of life, and learn about themselves. Ali used our volunteers for her pilot study, and came back a few months later to use us again for part of the main research. A number of other well-known volunteering conservation organisations around the world were included in the research project. The aim of this study was to apply previous research of tourist and volunteer behaviour to the field of volunteer tourism in order to understand the expectations of volunteer tourists as well as the benefits they seek, and receive, for their efforts. The results of this research will help generate an even more sustained conservation effort from each conservation volunteer and a higher level of overall productivity, benefiting your organisation and conservation efforts in general. • Help to promote the efforts of conservation organisations, such as Tolga Bat Hospital.